A new project Civic Dialogue gathered representatives of both state and independent think tanks, journalists and officials. Participants of the “What Do Belarusian Businesses Think” discussed results of latest research on competitiveness of Belarusian regions. Opposition on state TV. 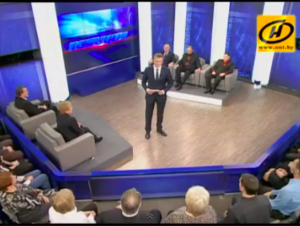 On 20 January a Belarusian state TV show called ‘Position’ raised a topic of the upcoming local elections. Two opposition figures – Valery Ukhnalov, the Spraviedlivy Mir political party, and Alexander Volchanin, United Civic Party – had a direct opportunity to talk with pro-governmental candidates and the CEC chair in the TV air. Bialacki may be freed if his debt has really been paid off. Human rights defender Ales Bialacki may be amnestied if all the money he owed has really been paid, Alexander Lukashenka said on 21 January in reply to a question from BelaPAN Director General Ales Lipai during a meeting with Belarusian media leaders. Lukashenka said that he was unaware of the fact that the amount that Bialacki was ordered to pay was paid off with donations a long time ago and tasked to find out whether or not that was true. Statkievich may be freed if he applies for pardon. Former presidential candidate Mikola Statkievich may be released from prison if he applies for a pardon, Alexander Lukashenka said on 21 January in reply to a question from BelaPAN Director General Ales Lipai during a meeting with Belarusian media leaders. On 22 January Maryna Adamovich, Statkievich’s wife, received a letter from her husband, in which Statkievich reiterated his position not to write any petition for pardon. Belarusian Foreign Ministry responded to representatives of a number of animal protection organisations – Zoo chance, Cat and Dog, Superkot, APB-BirdLife Belarus, etc. – that appealed to the Ministry with a proposal for joining Belarus to the Council of Europe Conventions on the protection of animals. The Foreign Ministry agrees that it's necessary to toughen the penalties for cruelty to animals, but the officials are waiting for addressing the issue of the profile government bodies. Civic Dialogue project launched. On 29 January Minsk hosted an expert roundtable "Belarus-EU relations after the Vilnius summit of Eastern Partnership". The event was attended by representatives of state and independent think tanks, governmental officials, EU representative, journalists. The event took place under a new project Civic Dialogue – an open platform aimed at discussion of actual problems and promoting a culture of constructive and mutually respectful dialogue between different social groups of Belarusian society. The project partners are the Centre for Strategic and Foreign Policy Studies and a newspaper "Zviazda". Appeal of the Belarusian civic activists to cease bloodshed in Kyiv. On 23 January the Belarusian civil society organisations and civic activists issued an open appeal to cease bloodshed in Kiev. The appeal urges all parties involved in the current political crisis in Ukraine to get consolidated and to undertake a peace-support mission. What Do Belarusian Businesses Think. On 31 January in Vilnius, Eastern Europe Studies Centre (EESC) and the Belarus Research Council (BRC) conducted the fourth live open panel discussion in series “What Do Belarusians Think?” The discussion is aimed at analysing the results of the latest economy research on the competitiveness of the regions in Belarus, carried out by the Research Centre of the Institute for Privatisation and Management. Pavel Daneika’s public lecture. On 31 January in Minsk, economist and BEROC director Pavel Daneika conducted a public lecture on "The phenomenon of private business in Belarus." The lecture was held as a part of the cycle "Urbi et Orbi" of Flying University and presented that today Belarus has its own unique business sector, which is radically different from the Ukrainian and Russian. Public Lecture by Andrei Degtyarev. On 3 February at the business centre Imaguru, a Russian expert in the field of public policy analysis, Professor Andrei Degtyarev conducted a public lecture "Decision-making in the modern system of public administration: Theoretical Models and Applications." The lecture was held under the auspices of BIPART project of the School of young managers in public administration (SYMPA). Roundtable on cooperation between CSOs and media. On 27 January the Assembly of NGOs held a round table on the cooperation between CSOs and the media. Journalists and civil activists met to discuss how to draw journalists’ attention to civil sector and how to build up ways of effective communication between public sector and the media. Media expert Pauliuk Bykouski presented results of his analysis how media cover the Belarusian CSOs activity; in particular, one of the study's conclusions is that Belarusian CSOs provide for the media much more negative stories about their divergences than their successes. One can find the presentation (in Belarusian) here. International Congress of Belarusian Studies calls for panels. Organising Committee announces the collection of applications to create sections/panels for the IV International Congress of Belarusian Studies which is to be held on 3-5 October 2014 in Kaunas (Lithuania). The organisers do not set clear thematic or disciplinary limits, leaving an opportunity for the academic and expert community to articulate their own priorities and interests. Deadline is 20 March 2014. Webinars for wheelchair users. From March 2014, Republican Association of Wheelchair Users starts a series of webinars on topics that cover wheelchair users' needs and interests. In real time anyone will be able to participate in webinars through the Internet. The first webinar will be held on the theme "Accessibility". NGOs and local elections round table. On 20 January in Minsk, the Assembly of pro-democratic NGOs conducted a round table on the topic NGOs and local elections: challenges, threats and opportunities. Civil activists from Vorsa, Gomel, Viliejka, Brest and Minsk discussed their role in the campaign and came to conclusion that the election campaign could become another opportunity to work with the public and unite local residents. Belarus Digest will broadcast live open panel discussion in series “What Do Belarusians Think?” organised by the Eastern Europe Studies Centre (EESC, Lithuania) and the Belarus Research Council (BRC). The fourth discussion “What do Belarus Businesses Think?” will analyse the results of the latest research on the competitiveness of the regions in Belarus, carried out by the Research Center of the Institute for Privatization and Management (IPM RC). Alexander Chubrik, director of the IPM RC will present research on “Competitiveness of Regions in Belarus: General Review”, which analyses the integrated indicators of competitiveness in the regions of Belarus. The research was based on the latest official statistical data and polls of entrepreneurs. After the presentation, representatives of various Belarusian business associations and independent experts will discuss what Belarusian businessmen think about the business climate in their country, as well as the country's infrastructure, institutions and policies. Vadim Sehovich from the Belarusian news portal “Ezhednevnik” will compare and contrast the results from the ratings of the most successful Belarusian businesses. Sergei Nikoliuk from the Institute of Independent Socio-Economic and Political Studies will discuss the public's attitude towards the business climate in Belarus. The discussion will be moderated by journalist Maria Sadovskaya-Komlach. Alexander Chubrik earned his Master’s degree in Economics from the Department of Economics at the Belarusian State University (BSU) in 2000 and attended post-graduate studies at the BSU in 2000-2003. He has also worked as a vice president of CASE Belarus (2007-2012). Currently, he is a director of the Research Centre of the Institute for Privatization and Management (since 2011), a CASE fellow, and a lecturer at the European Humanities University (EHU). His expertise includes macroeconomics and private sector development in Belarus. Siarhei Nikaliuk has been an expert of the Independent Institute of Socio-Economic and Political Studies (IISEPS) since 2006. Mr. Nikaliuk graduated from the Department of Chemistry at the Belarusian State University in 1974. He has worked as a journalist after registering the first independent newspaper in Belarus. His interests include the social, political and cultural particularities of the Belarusian society as a society that has not completed its process of modernization. Maria Sadovskaya-Komlach is a Belarusian journalist with 15 years of professional experience. She graduated from the Columbia University School of Journalism (New York) in 2011. Maria writes about international affairs and, in particular, EU policies and Belarus-EU relations. She cooperates with Belarusian print, broadcasting and online media.